The 2030 report underscores the fact that the high school graduating class of 2030 is already in the first grade. And, when today’s first graders join the workforce, they will be entering a business community that’s very different from today, applying for jobs in industries that do not currently exist. The discussion covered the region’s strong industry sectors, growing and expanding industries, developing a hub for innovative entrepreneurship and stressed the importance of supporting regional mobility through transportation. The 2030 report highlights how the decade leading up to 2030 will transform the Orlando region with shifting demographics, new demands for skilled labor and increased stress on the region’s infrastructure. The Orlando region is projected to add 1,500 people per week to reach a population of 5.2 million people, upwards of 500,000 new jobs and, concurrently, 600,000 extra cars on the road. These economic projections stress the need for a robust transportation system, especially in light of the expectation of the four area counties and the city of Orlando to fund SunRail starting in 2021. “We need to deal with issues like our mass transit system,” Mayor Demings said. He pointed to the fact the Orange County needs a dedicated funding source for regional transportation. In other parts of the region, transportation initiatives are being decided by voters. Osceola County Commissioners recently decided to move forward with a ballot referendum to add a penny to the county sales tax to fund transportation needs. “We know that if we don’t have our transportation, we don’t have economic growth,” Grieb said. Sean Snaith, Ph.D., director of the University of Central Florida Institute for Economic Competitiveness, said during his annual economic forecast that the I-4 corridor will be an important driver of the state’s economy. “We’re on the brink of becoming a very major metropolitan area and we need a major transportation network to facilitate that,” Snaith said. 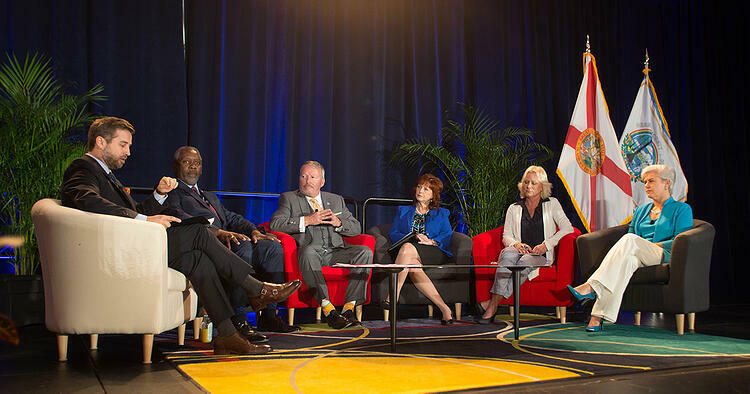 As today’s students prepare to join tomorrow’s workforce, it is important for regional leaders to consider how technology and automation will change the skills demanded of them, and how the business community can grow to support those needs. The Orlando Florida region, when compared internationally, ranks as the 47 largest global economy, behind Portugal and ahead of Romania. With a fresh and united perspective across the region, what’s good one county benefits the rest.